Lewis Bruce will be a key man for Peterborough Town on Finals Day in the Northants T20 Championship at Bretton Gate. Peterborough Town expect to wheel out the big guns for finals day in the Northants T20 Championship at Bretton Gate on Sunday (from 10,30am). The city side have included Lewis Bruce and Rob Sayer in their squad for a semi-final against local rivals Oundle and then hopefully a final against either Premier Division leaders and reigning Northants T20 champions ONs or strugglers Brixworth. Former captain Bruce has played just two Northants Premier Division matches all season because of family commitments while Sayer hasn’t made an appearance since the opening day of the campaign because of injury. 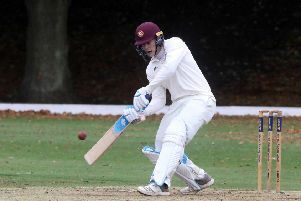 There could also be a place for new recruit Ed Alexander , a hard-hitting batsman of ECB Premier League standard who made a run-a-ball 83 for Town seconds on his club debut last weekend. “We’re looking strong,” Town skipper David Clarke said. “It’s a big competition for us. We have won it a few times, but to win it on our ground would be special. Town will be without fast bowler David Sayer as he’s on holiday. He will also miss Saturday’s Northants Premier Division game at troubled Rushton. Town will also be without Jamie Smith so they may rely on their army of spin bowlers to gain what should be a routine win against a team who have suffered the loss of numerous players since a second-place finish last season. Town dropped a place to third last weekend after losing for the first time this summer to title rivals Finedon.